Is Ill Valley a geographical location, a state of mind, or both? Whatever the answer may be, Kahokule'a "Hoku" Haiku and Patrick John have put the place on the musical map in fine style with this impressive debut release. Innovation is hard to find in the local hip-hop and rap scene, but these self-styled "savages from the Sandwiches" have set themselves apart from the rest of the pack. 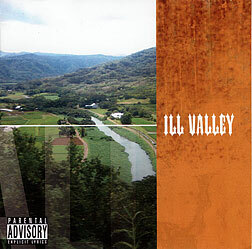 They introduce the Ill Valley lifestyle with "Aloha Til It's Ova" and prove themselves entertaining and resourceful performer/producers with each track that follows. The minimal use of melody, combined with catchy percussion, suggests a rural milieu. "Jus Da Haps" shares humorous accounts of the ups and downs of local life that include errant pit bulls, encounters with the police in Waikiki and "a haole chick in a tourist trap." "Ashes of the Past" stands out as a well-reasoned statement on the toxic effects of slowly selling off the " 'aina to the highest bidder." The duo decries a pseudo-Hawaiian culture of "leis made of plastic and tacky tiki glasses" and warns that "every single condo can't have koa cabinets." The mood and subject matter change again as acoustic guitar and assorted percussion give a mellow back porch feel to "Old School Toyota." Keen ears will note the influence of Snoop Dogg on "Pitchin' on Da Block," and melodies reminiscent of Terence Trent D'Arby and Milli Vanilli elsewhere, but there's nothing that makes unfair or uncredited use of the work of other artists. 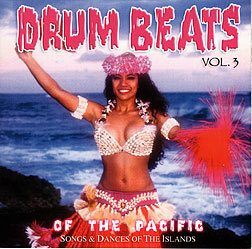 The third album in Flip McDiarmid's "Drum Beats of the Pacific" series will appeal primarily to ethnomusicologists and students of Polynesian dance, although adventurous club deejays and hip-hop producers may find it of interest as well for the beats contained here. Anyone else interested in learning about the percussion that provides the foundation for Polynesian dance will find this album is an excellent introduction. The series' annotator, Dr. Jon Tikivanotau Jonassen, provides a brief but detailed overview of the differences that are found in instruments and drumming styles across Polynesia, along with drummers' notation for each song. With all this information available, it doesn't take long to start appreciating the nuances of this important part of Polynesian culture. 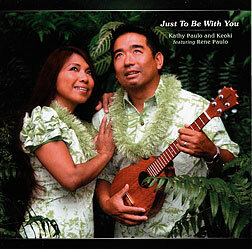 Kathy Paulo and her husband, Keoki Hirai, take possession of the musical niche once dominated by Randy and Gay Hongo with this collection of Christian-themed and inspirational songs. Kathy's father, Rene Paulo, joins them on piano, and with several other members of the ohana sitting in on various tracks, the general feeling on the album is one of family fellowship. The album gets off to an unpromising start, however, due to the use of synthesized string tracks as filler in the first song. But things improve thereafter. On the title track, one of several original songs on the album, the use of abrupt breaks in the rhythmic pattern of the lyrics effectively suggests the off-balance moments of daily life. Kathy and Keoki also interpret several Christian standards in memorable style. Their version of "It Is Well With My Soul" touches the heart, and they do a beautiful job with "Amazing Grace," as well. A medley of "Over The Rainbow" and "What A Wonderful World" adds two island favorites that are "inspirational" rather than directly Christian in origin, but which convey similar positive messages. "Hawai'i Aloha" may seem like a stretch, but it too fits. Lorenzo Lyons' Hawaiian lyrics express his love of Hawaii, and James McGranahan wrote the melody for a Christian hymn, "I Left It All With Jesus," so there are spiritual elements there too.